(Nanowerk News) The University of Texas at Austin's nanoscience building has been named the Larry R. Faulkner Nano Science and Technology Building by the UT System Board of Regents in recognition of former President Faulkner's leadership in bringing the university's nanotechnology program to national prominence. Dr. Larry Faulkner, president emeritus of The University of Texas at Austin. The 82,463-square-foot Nano Science and Technology Building at 102 East 24th St. behind the new Norman Hackerman Building was completed in 2006. The state-of-the-art educational and research facility houses programs for the promotion of nanoscience and nanotechnology. Nanoscience is driving fundamental research in many areas of science and engineering, including the development of new solar energy technologies, health diagnostics and treatments, and energy storage devices. Faulkner was president of The University of Texas at Austin from April 1998 through January 2006. He received his doctor's degree in chemistry from the university in 1969 and worked in the lab of Chemistry Professor Allen Bard. He was on the chemistry faculties and in leadership positions at Harvard University, the University of Illinois at Urbana-Champaign and The University of Texas at Austin. He is the co-author of the prominent text "Electrochemical Methods: Fundamentals and Applications." Faulkner has received numerous prestigious awards and honors, including election into the American Academy of Arts and Sciences. 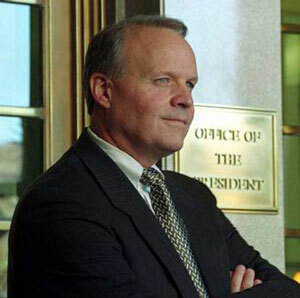 He is president of the Houston Endowment, Inc., and is president emeritus of The University of Texas at Austin. The College of Natural Sciences, which is home to the Center for Nano and Molecular Science and Technology and Department of Chemistry and Biochemistry, is also raising funds to establish the Larry R. Faulkner Departmental Chair for Excellence in Chemistry and Biochemistry. For more information on nanoscience and nanotechnology research in the College of Natural Sciences and at the university, visit the Center for Nano and Molecular Science and Technology Web site.